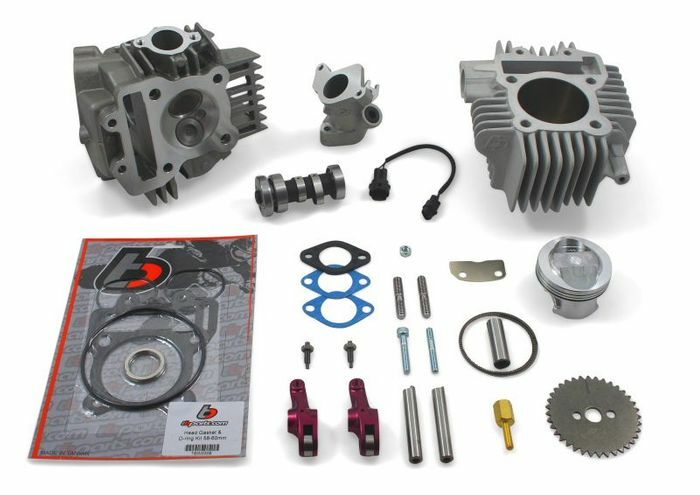 60mm Ceramic coated all aluminum cylinder (no steel sleeve) Lightweight high compression domed 60mm piston with rings, pin, & clips (will safely run on pump gas, 90-93 octane) Head gasket kit – Now includes the cylinder head o-ring set and an exhaust gasket. The all aluminum ceramic coated cylinder is not only lighter than a steel sleeved aluminum cylinder, it is harder, reduces friction (increasing power), improves sealing, and provides better heat transfer (runs cooler and cools down quicker). Additionally, this is the biggest bore kit you can install without needing machining to the cases (case boring). Forged anodized aluminum roller rockers Huge 30mm intake and 24.5mm exhaust valves Stainless Steel Valves (21-4N material) 27mm intake port, 23mm exhaust port Race Camshaft V2-1 (TBW0473) Cam Sprocket The combination of the above features in this Race Head V2 deliver huge power gains over the stock basic OEM cylinder head.